Experiments aimed at unlocking secrets of time travel are being led by Aberdeen University. Researchers are examining the fabric of space time and what science fiction authors refer to as the fourth dimension. Dr Charles Wang will study the microscopic movement of atoms, which can be affected by the earth spinning. He said: "This is a very interesting possibility which cannot entirely be ruled out by physics." Television's Dr Who and the Back to the Future movies promised the concept of time travel. Albert Einstein said instead of considering space to be a shapeless vacuum it should be looked at as an object. The theory is for something to exist it must have length, breadth and thickness, the three dimensions. It must also have something else. An object exists from the moment it is created to the moment it is destroyed. In between those moments is the duration of time - the so-called fourth dimension. HG Wells wrote the Time Machine about it - now Dr Wang hopes to make it real. He is a reader in the College of Physical Sciences and a member of the Aberdeen centre for applied dynamics research. Dr Wang said he is waiting for the European Space Agency (ESA) to launch a science satellite to aid his research. 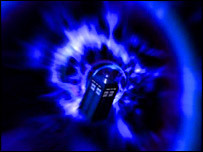 He told BBC Scotland: "If you have curved space time, the time circles and you might just travel in time. "If we can slow down the atom and isolate it and guide into the fluctuation then there's a possibility it's there. "The increased sensitivity obtained by a space experiment certainly makes a space mission very worthwhile. "If successful the results will have a profound impact on our understanding of the fundamental nature of space and time in the universe." Dr Wang however has time on his hands, as the ESA satellite is not due for launch until 2015.